Fight for the flag is a strategic game. Each team has its own flag that has to defend. The target is to fight one's way into the enemy's flag and then bring it back to its own one. There is a flag placed in the middle of the field. The game starts and players have 150 seconds to take their positions. After a signal the game begins. The team that has as first the flag in its position is the winner. A flag is placed in the house. Players have 150 seconds to take their positions. Who is the first to take the flag down and bring it back to the starting point is the winner. There is a hero in your group ready to fight all alone with the others. He has 3 lives. Does he manage to defeat you all? Elves are magical creatures that could be hit only by a headshot. Do you have the courage to do that? The classic game where two teams stand against each other and their target is to hit one another. Two teams stand against each other and the target is to hit all of the enemy team. The game is situated on both floors of the indoor field and due to the stairs enemies are everywhere. Your team is in the enemy's area and you are there to safe your helpless pall Carlos (it is a figurine in a life size) Team that is the first taking Carlos safely back home is the winner. It is a really exacting game so it is played with more than 1 life. It means that every player which get hit goes back to the start position, count to ten and start again. This game is just for thick-skinned. Just pick a field and imagine a scenario/ write us your requirements in written form or just call us. How do you play paintball? 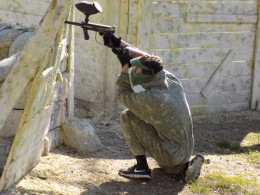 Firstly, paintball is a team game where it is about the team winning not about an individual winner. The players start from the starting point by a signal. It is their tactics who runs where and how do they cooperate to fulfil the task. 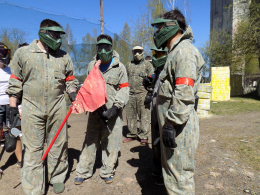 During the game they try to eliminate the enemy by a hit of the paintballs to all of their body or gear. The hit player leaves the field with no further contact or participation in the game. Usually those who stay alive finish the task and win the game. Before the next game the hoppers are filled and the hits are cleaned. The games take 3-5 minutes, so do not worry that you will be waiting while the others are playing. In PPA there are scenarios as PPA BIG GAME or COUNTER STRIKE for those demanding ones.